As with the striped stockings, both the depictions and the descriptions seem to indicate that ribbed stockings were only worn by men. “CATHERINE LING sworn. There were an old pair of white ribbed stockings about the kitchen, and I said the prisoner might have them, they were not worth a farthing, these are not the stockings. Prosecutor. These are not the stockings he took from my house, they were in the handkerchief before the headborough. Court to Sadler. What is become of the stockings? - These are the stockings, there were no other. Prosecutor. 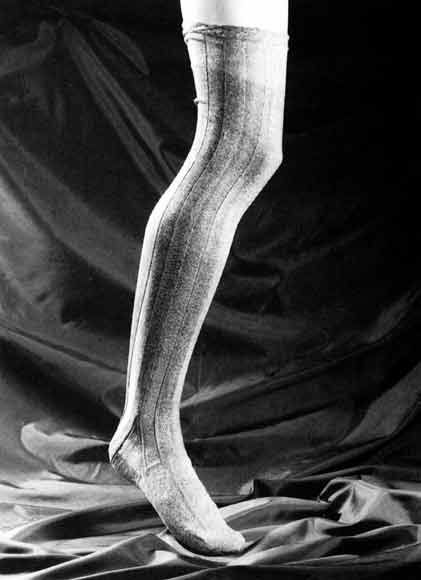 They were ribbed stockings my Lord. Mr. Peatt to Ling. Were the stockings ribbed that you gave the prisoner? - Yes, they were ribbed stockings, nor worth a farthing. Prosecutor. They were in the handkerchief with the other things. Were they new stockings? - No. Were they old? - They were in the middling way, they might be darned in the heels. Did they lay about the kitchen? - In the tap room there is a bureau where a great number of my stockings are, and sometimes they are thrown in there. “Mr. FIELDSEND's Shopman sworn. I live with Mr. Fieldsend, he is a linen-draper and hosier ; the 27th of May, the prisoner came into the shop about one o'clock, and asked to look at some ribbed stockings; I do not recollect ever seeing him before; I saw my fellow-servant shewing him some stockings; his name is Benjamin Shaw ; when he had shewn two pair, he called me forwards; he desired me to go on the other side of the counter, for the prisoner had concealed two pair of stockings; then the prisoner ran out of the shop; he threw down four shillings upon the counter for a pair of stockings he had bargained for, but he did not take those stockings; we pursued the prisoner, and took him; I saw the stockings in his pocket, as he went out of the shop. (Produced and deposed to.) They cost three shillings and sixpence, they were not at all the worse. “Q. Look at these two pair of stockings, and tell me if they are your brother's property or not? - A.They are entire silk; and this pair of stockings, with the white feet, has my own mark upon it; the other has not the ticket upon it, but it is a particular rib, and is the only pair we had of this pattern, they were folded up with the white feet hanging out underneath; it was folded up, by myself, in a bundle for show, and that pair was the top-most; they were all safe at twelve o'clock at night when I went to bed; I always go round the shop the last thing before I go to bed, to see that every thing is safe. Thanks to Paul Dickfoss for many of the descriptions above, some of which were originally collected and transcribed by Mike Barbieri.